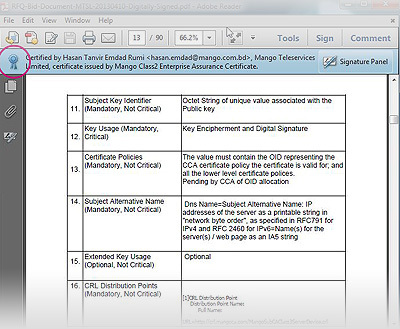 You can use “Mango PDF Signer” for free to apply your digital signature. PDF Document signing is achieved using Mango CA Digital Certificate solution using a Class-2 Certificates for individuals or Enterprise users. Adding a certifying signature to a PDF means you are the author of the document, have finalized its contents, and want to secure it against tampering after it has been distributed. Certified documents display a blue ribbon across the top of the document containing the signer’s name and the Certificate issuer – a clear, visual indicator of document authenticity and authorship.
? Healthcare Industry: Prove the origin of confidential reports and ensure they cannot be altered after distribution.
? Architecture/Engineering/Construction Industry: Protect your intellectual property by making sure no one can make any changes to your drawings or plans after publishing. You can also choose to include your Professional Engineer seal as part of your signature.
? eGovernence: Many Departments of government and other regulating bodies require digital signatures for electronic document submission. If you receive or create a PDF with a digital signature field, you can use your PDF Signing Certificate to add your signature. Signatures can be customized to include an image (e.g., your physical signature or official seal) and various signature details (e.g., signing location, date, reason for signing). For Acrobat to access the certificate (signing key) on your USB token, you must have installed the SafeNet eToken or Feitian ePass drivers for your Operating System.